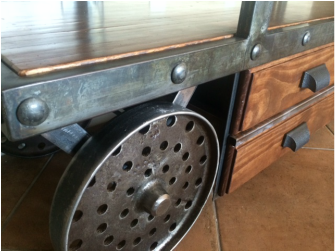 Industrial TV Console made with 2" thick salvaged bowling alley and some vintage farm equipment wheels. Weighs in at 315 pounds! A very Rustic way to house all the electronics. 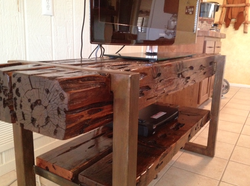 This media center was built using 6x8 cedar timbers and 3" thick planks. The steel was rusted and the wood was done in a high gloss finish.